The five-judge bench of the Lahore High Court ruled invalid a constitutional amendment which took away the power of the judiciary to question imposing martial law. 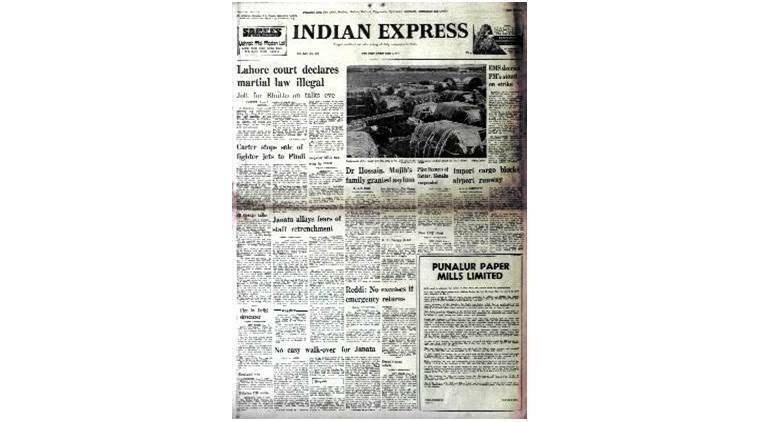 A Pakistani high court shocked the government by ruling that martial law imposed by Prime minister Zulfikar Ali Bhutto six weeks earlier was illegal under the constitution. The five-judge bench of the Lahore High Court ruled invalid a constitutional amendment which took away the power of the judiciary to question imposing martial law. CPM leader E.M.S. Namboodirippad reacted sharply to the pronouncement by PM Morarji Desai that “strikes” and “gheraos” would not be permitted. He said to resort to strike and gherao was a right of workers and no working class party could accept any curbs on this. He expressed astonishment over the stand of the Union Home Minister Charan Singh that the Naxalites in detention must give an undertaking disowning their creed to secure their release. He said it was unimaginable that a democratic government should want any section of people or party to abandon their political philosophy. Congress President Brahmananda Reddy said that if ever in the distant future the Emergency would have to be imposed again, “steps will have to be taken to see that there is no misuse of authority”. Reddy was asked by newsmen if this meant that he believed in the Emergency. He replied that it did not matter if any individual believed in it or not but the “Constitution framers believed in the Emergency”. Speaking of his own role during the Emergency, he said he tried to do his job, but if there had been any excesses, “ I wish to express my deep regret”.